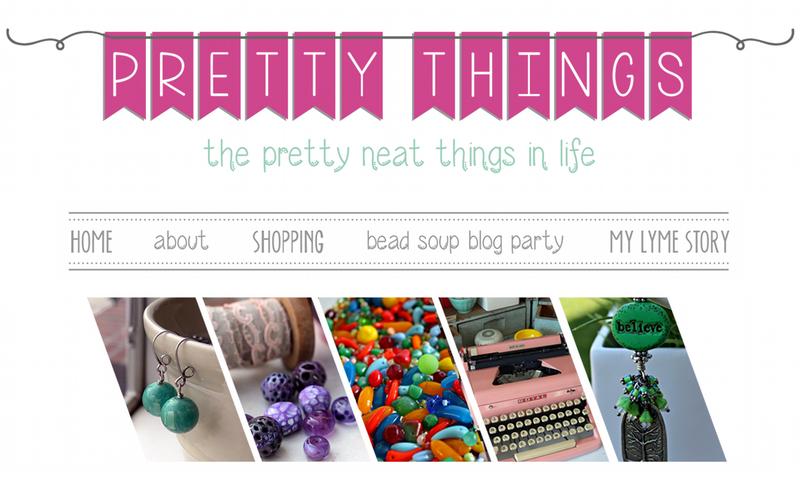 Pretty Things: More Lark Books to Give Away! I'm sure the book about bracelets is full of so much inspiration but I've got my eye on that Dimensional Bead Embroidery book! Here's hoping!! That bracelet book looks pretty cool! ('d love the Jamie Cloud Eakin book! I haven't done any bead embroidery and think it's time I learned! Would love some inspiration!!! That bracelet book looks yummy! 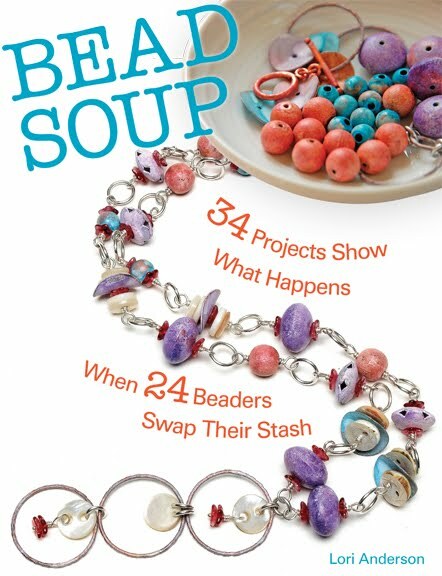 I would LOVE to win the seed bead book - thanks for the opportunity!! Too bad the bracelet book doesn't have step by step. I know several people who just wouldn't be able to figure out how to make something by just looking. The beaded embroidery one sounds interesting and something I haven't done. That 30 minute bracelet looks like an amazing addition to my library as I am back to work and so trying tutorials and stuff to learn as much as I can. Thanks again for a chance of winning a great book! I'd be happy to win either book:). Though I should try my hand a bead embroidery to reduce my seed bead stash, lol. The 30-Minute Bracelets book sounds fantastic. I like the idea of working with metal and leather. Thanks again for the reviews and giveaway-both are appreciated! These would be wonderful resource books to have around! OOOhhh I don't know which book I like the best. It's great to read your reviews Lori! I can see myself using the 30 Minute Bracelets Book lots and lots!! I can see myself referring to the 30 Minute Bracelets Book lots and often! The bracelet book would be a nice dose of inspiration. That dimensional beading book looks amazing! I'm a book junkie, though, so I'd love either! More great stuff! Thanks for sharing! The bracelet book sounds very cool. I would LOVE to have that beading book....looks fab! Now where will I find an antler tip? Isn't yours such an interesting life? Getting to review intriguing books and share them with friends! Yummy! I want the bracelets in 30 minutes. I wish i could bead and make something that quick. I usually spend 30 minutes just sorting a few beads... Lol! Did my first comment go through awhile ago? If not,i oh so want the Bracelet in 30 minutes book. Hopefully, i can make one in 30 mins too because it usually takes me a long time to make one. Lol! 30-minute bracelets is definately for me - and since by B-day is Friday..... ;-). These books are awesome, great giveaway! Ohhhh! I would love to win! Thank you! 30-Minute Bracelets? I would love to learn the secrets!! What a fabulous opportunity! Even with all the beading books I own, I don't have any of these. Would LOVE to win! Such a generous giveaway! I'd love either one of these books. Thanks for the chance for a great giveaway again. would love to win, bracelets most but either would be ok by me Lori! Thanks for the chance to win! Books are my other addiction. Count me in. Love this colelction of books, please drop my name in the hat. I have blogged about your giveaway. Thanks for the giveaway. I just love learning new things and techniques and then passing my knowledge on. It is great that you are doing these give aways. Books are Great. 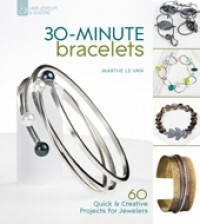 I'm a big fan of bracelets myself, so I'm drawn to that 30-minute bracelet book! Thank you for this fantastic opportunity! I would love either of those books, but that Jamie Cloud Eakin book has been on my "want" list for about a year. I took a class last fall and it got me started and hooked on beaded embroidery! I also posted on FB about how much I would love to win a book! Especially that Jamie Cloud Eakin book! Would love either book but really like the bracelet book. Thanks for the opportunity Lori. Oh I have my eye on th bracelet book. Thanks for all you do! I have my eye on that interesting bracelet book. Thanks for all you do! Although I don't do bead embroidery, both of these books look great. Thanks. 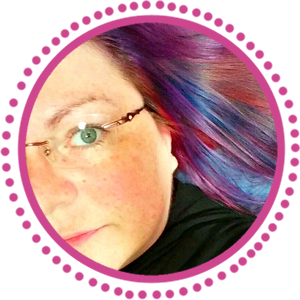 I would LOVE to be added for a chance to win. The bracelet book looks wonderful!! I would like to share the shipping fee for the "Dimensional Bead Embroidery -- A Reference Guide to Techniques"
It looks interesting!! Thank you Lori. Yes please! I've had the Jamie Cloud Eakin book on my wish list since I first saw it was coming out. I can't wait to see it. I'd love the bracelets book!! I would love to add any of these books to my library! Pretty please count me in! 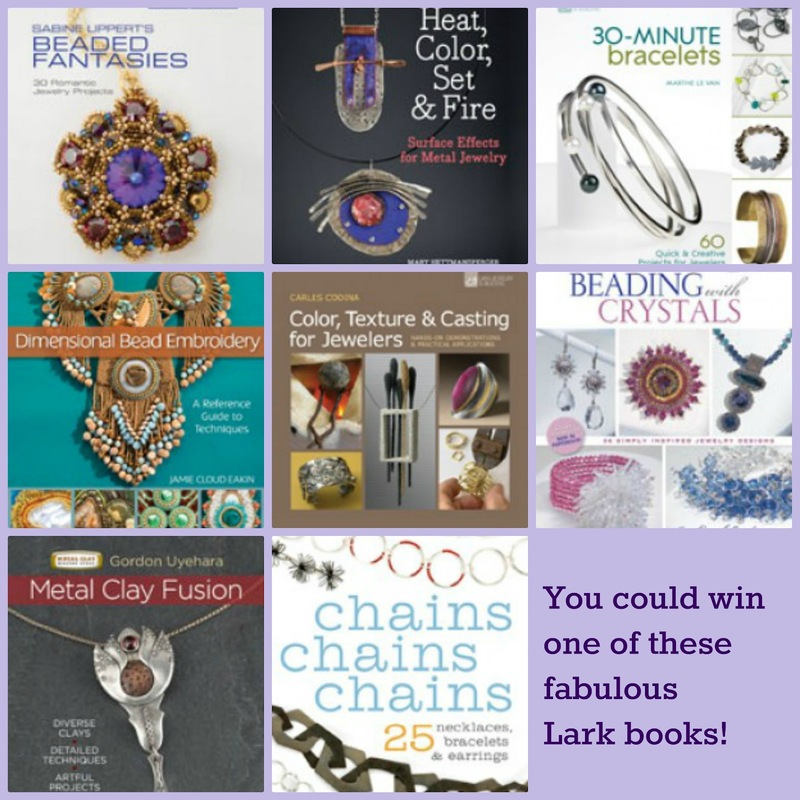 All the Lark books are fabulous -- I'd really love to win a copy of Dimensional Bead Embroidery. I would love to win either one! The look awesome!!! I've seen the bead embroidery book at my library and there are so many wonderful patterns in it. I'd love it in my collection! I became fascinated with bead embroidery when I was in SE Asia and watched the artisans create gorgeous beaded dresses with layers of sequins and beads. I actually had one made for me - the skirt weighs almost 5 lbs! I'd love to learn more techniques, so Jaimie's book looks wonderful! Yay, I love books...sign me up please! Both of these look great! I would love to win either one. 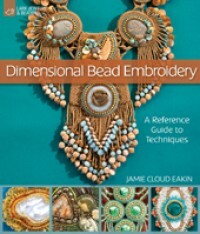 I already have "Dimensional Bead Embroidery" & I agree with Lori it is a gem. It's my favorite of all the bead books that I have & it taught me really a lot. I would like a chance to win the bracelet book though. Would love to win the bracelet book! Thanks! Would LOVE the bracelet book!! Thanks for the opportunity! This would be fantastic. Any book would be awesome, but I'd love the one on casting! Wonderful books! I'd love to win one! Thanks so much! What great books! 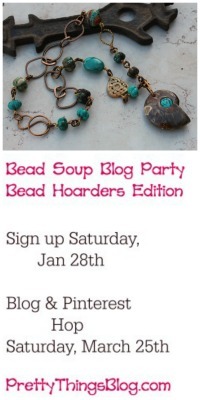 I'd LOVE to add them to my jewelry making library...please sign me up for the giveaways! OMG - I'm DYING for some new inspiration! These would rock! No problem with the shipping charge. I would love to win the embroidery book! I love her cabochon book. I would LOVE the bracelet book! It looks amazing. Oh, it's a fantastic opportunity. I focus on Sabine's book. It would be marvellous to get it. 30 Minute Bracelets looks good. All I really needs is a "look book", so that works for me! All of these books look great! Especially the 30 Minute Bracelet book. For some reason I always make necklaces and earring, but bracelets seem to "stump" me!